It seems as though the idiom “honesty is the best policy” may be more than just a cliché. According to a study done at the American Psychology Association’s 120th Annual Convention, being more honest can lead to boosts in physical and mental health. So how do you apply this to your everyday life? Straight out the gate: It takes just seconds to decide if you are going to lie or tell the truth, and that time is imperative. Try the good old “think before you speak” method when you feel a fib about to escape. This may be a good strategy on the first date. Instead of rushing through the 20 Questions phase, take some time to make sure you’re being as truthful as possible. Rule of Three: The average person tells about 11 lies per week. Surprisingly the APA study found that telling just three fewer lies a week can make a difference. In dating, we all may feel the need to seem busier, more interesting or just plain cooler. Try sticking to what you’re actually up to and what you actually like to eat and the music you actually listen to, and three less lies a week should be a breeze. The inner affects the outer: We’re no strangers to the fact that the mind affects the body, and this case is no different. 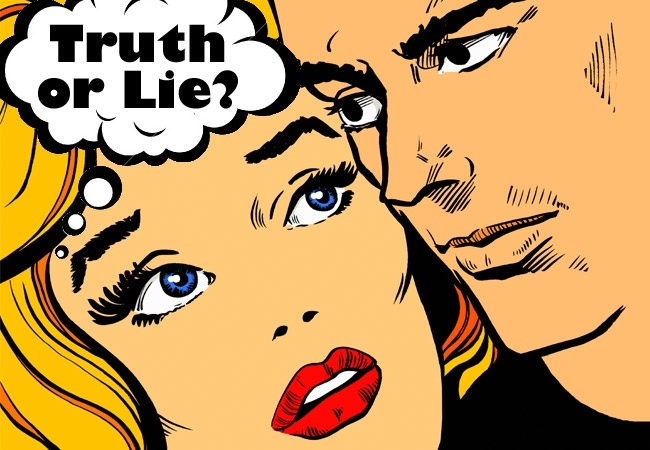 Lying leads to inner stress, which affects physical health. Participants who were more honest in this study reported two fewer mental health complaints and one less physical health complaint. If none of those benefits are worth passing the dating polygraph, perhaps less sore throats and headaches are. These were benefits of honesty, too. The Question Defense: This trick may be a bit annoying for the person you’re dating, but the physical benefits of honesty may be worth it. There are some questions that are just too uncomfortable to answer, and when times like these arise, it may be time for a defense mechanism. Try answering those heavy questions with a question of your own, maybe you can deflect a falsehood in the process. No exaggeration necessary: Dating is hyperbole’s playground. In an effort to become a keeper, we all find ourselves beefing up our resumes a bit. One foolproof way to solidify a healthy connection with the seemingly mate of your dreams is to let your real accomplishments speak for themselves. What’s worse? Not fitting the part or snagging someone under false pretenses? The Five Week Transformation: The APA’s study also revealed that after avoiding minor and major lies over the course of five weeks, participants felt like they could be more honest overall. Five weeks may also be a good timeframe for foundation-building with a new prospect. Filling that time with as few white lies as possible should make for a better sense of where you two are headed and a good way to see if they like you for you. Do you think this advice makes sense, or are some white lies just necessary when getting into a new relationship?